About 13 years ago I got my first chainsaw. I had never used a chainsaw before. I had watched as a family friend cut down a couple trees on my parents’ property once when I was about 16. That’s as close as I’d ever been to a running chainsaw. But when we moved to the Muskokas we settled in to a rural home with a woodstove. We have a forested acreage, so I learned to make my own firewood. Now, I know that you’re probably wondering what this has to do with time management. Well, stick with me and you’ll see how it relates. I promise! My first task when getting the saw was to get one that was big enough for the job. I couldn’t use just any saw. So I picked out an 18″ saw at Canadian Tire. I didn’t plan on cutting any trees bigger than that could handle. Later I learned that there is a lot more to choosing a saw than that. I did a lot of research (thank you Google) on how to properly (and safely) cut trees, limb them, buck (cut into logs) and skid (drag them to where you want them). I also learned how to split them into firewood. I made mistakes along the way. To quote the Thomas the Tank Engine stories “Luckily no one was hurt.” But in the past 13 years I’ve learned a thing or three. One lesson that I didn’t learn until my first saw died is that you need to have the right tool for the job. 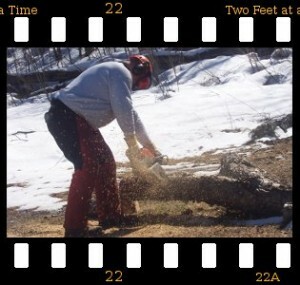 The nice 18″ saw that I originally bought was a great little saw, unless you needed to cut a few cords of firewood a year. It was actually underpowered and not built as solidly as some of the more expensive saws. When I finally got the right saw, it was a bit shorter but much more powerful. I couldn’t believe how much better (and faster) it cut through the wood. For 5 years I’d been wasting time with an underpowered saw! The new saw is also more solidly built, so it can handle the amount of work it’s being used for. Lesson #1: A cheaper tool may get you by for a while, but the proper tool for the job will last longer and work better. It will make you more efficient! A chainsaw works by dragging a series of cutting teeth linked together like a bicycle chain around a bar. The teeth are shaped in such a way that they each cut a piece of wood out of the log without cutting too much at once. After about an hour of use the teeth start to lose their edge and the chain drags more. It takes longer to make a cut. I had to learn how to effectively sharpen a chain. This is not as easy as you might think. If a tooth is not sharpened to the same angle and depth as the other teeth around it, it can dig too deep or not deep enough. This will cause the saw to work harder as it slows down and speeds up depending on which teeth are in contact with the wood. So I learned how to do a basic sharpening job. But after 2 or 3 times I need to bring the chain in to the shop where it is sharpened by a machine that gets it right every time. Lesson #2: Learn how to keep your tools working well and outsource the job when needed. Then you can focus on getting the job done quickly and efficiently. Selectively harvesting firewood makes for a sustainable supply of firewood and maintains the health of your forest. But it is much harder than just going in and cutting everything down. The tricky part is getting the trees to fall in the direction that will keep them from getting caught up in other trees. When a tree gets caught up it is dangerous, time consuming and can damage the other trees. Before cutting a tree I need to determine where the best place is for it to land. Then I have to look a where the tree is leaning. In some cases I may have to pick a different landing zone since the tree won’t go where I’d like. Once I’ve decided which way to cut, I have to properly line up the cuts I make and possibly use some wedges or come-a-longs to direct the tree in the proper direction. Doing this helps me get more trees cut in the time that I have. Lesson #3: Taking the time to plan a job helps you make the right steps at the right time. The job gets done quicker and correctly. Despite good planning, things do go wrong. I will often have a tree hang up on other trees as it falls a little too far to the left or right. Or worse, I may have misjudged the lean and the tree starts to shift backwards, binding the saw so I can’t continue the cut. 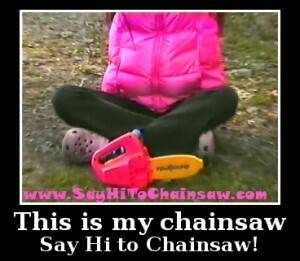 Speaking of chainsaws… you might get a kick out of this video I created with my daughter a few years back. Lesson #4: Things will go wrong from time to time. Try to have the tools and plans to correct anticipated problems close by so you don’t waste time. Having a toolkit that is easy to grab and bring with you really helps. 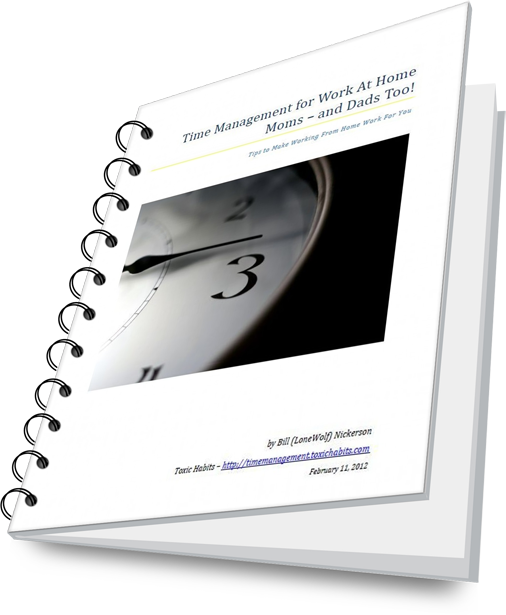 I promised you that this all has something to do with time management. You’ve probably figured it out already, but just in case you missed it, the 4 lessons can be applied to any job that you are doing. Whenever you’re working on your business you need to keep these 4 lessons in mind. They won’t help you get more time, but they will help you to maximize the effectiveness of the time that you have. What time management lessons have you learned along the way? Please share them in the comments. Especially the maintenance part is very important. A tool which is too difficult to maintain is quite useless in the long run. That’s why it’s always important to figure the maintenance part in advance – before buying the tool.